Birthaläm or Biertan is more than a medieval fortified church; it is a reminiscent of the rich culture and customary as well as religious benevolence of Transylvanian Saxons. This church was built around 600 years ago and it happens to be a UNESCO heritage site. 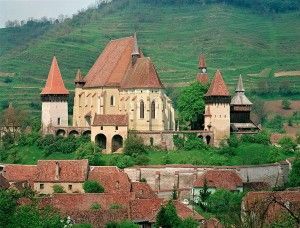 Biertan was created by Transylvania Saxons, when Hungary used to be the medieval kingdom. Biertan is situated in Transylvania’s south-eastern part and located in the center of Romania. This place is a part of the Sibiu county, and it is located only 30Km away from Sighisoara while it is 81km away from Sibiu. You can reach Biertan easily by car. To reach there, you need to travel through the towns of Sighisoara of Medias. The Biertan Fortified Church was built during 1490 and 1524 but additions in its interior designing kept on until the 19th century. The construction style of this church is inspired from Renaissance art and late Gothic architecture forms. In fact, it is the last of all Gothic style buildings that were constructed in Transylvania. While your travel through this amazing and magnanimous church, you are basically travelling back in time because it is so well-preserved that you would be amazed. This is an extremely impressive church that is surrounded and well-protected by exterior walls and a number of towers that were built around the same time. In the entire church complex, the most outstanding building is the matrimonial prison. This prison was the place where couples who sought divorce were forcefully sent to spend two weeks together and share a single room, single chair and a single set of tableware. Biertan Church’s one tower was transformed into a catholic chapel when in the 16th century most of the Saxons converted to Protestant ideology of religious beliefs. So, those who remained true to the original set of religious beliefs got the tower transformed into a catholic chapel. The main edifice of this church comprises of a main church hall that contains three naves distributed via arches to form an intricate network. These arches were damaged after an earthquake hit Transylvania in 1977 but it was again restored and consolidated by the government. 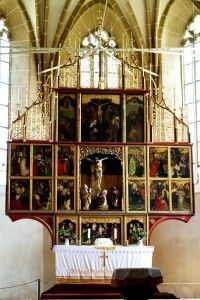 The church contains a late Gothic shrine in the inside, which was built between 1515 and 1524, by master painters from Wien and Nuremberg in the form of a triptych, the biggest one of its type in Transylvania. The Church’s pews were constructed by Johannes Reychmut from Sighisoara during 1514 and 1523. These pews are regarded as most valuable of their kind in Transylvania. The sacristy door of this Church is also quite unique; it was built in 1515 and is inspirational due to its exclusive blocking system. The present state of church is embellished by 16th century décor and its inner wall was fortified during the 16th century as well. The church has 8 towers that unfold in a spiral shape, which gives away the look of a three-towered belt encompassing the hill. The harmony between the architectonic church and the locality is simply impeccable. This church is of immense historic and esthetic value because its original substance has been preserved perfectly since late 15th and early 16th centuries. This is why the church was included in the UNESCO List of World Patrimony. This is every bit an exceptional and mesmerizing historic monument and more like an architectural masterpiece because it is expressive of the location that was colonized by the Transylvania Saxons. The value of Biertan’s Medieval Fortified Church is further enhanced by the fact that out of the 300 fortified churches that were built during 15th and 16th centuries this church has been preserved very well. It therefore, serves as a true reflector of the architectural expertise and inclinations of the Saxons. The Church is located on a high hillock that forms the central point of the transverse valley, which is surrounded by vineyards, forests and maize cultures. Still the frescos of the early 16th century are evident at the Southern side tower of the church’s inner wall. The Saxons bishops’ tombstones are also present in their original form in the Mausoleum tower of the church. The church’s walls were painted in Central European Baroque and Renaissance style walls that were a rage during the 16th century and the walls’ structure is created from stone. The western tower of the Church is a bit heightened and comprises of storeys that were used for defensive purposes. There are various interesting exhibits inside the church such as the country’s largest polyptych altar that depicts 28 scenes from Jesus and Mother Mary’s lifetime. The 16th century pulpit of this church was carved in stone whereas the pews offer truly valuable marquetry. There is a gallery present in the church’s western area where you will see the organ constructed by the famous 19th century organ builder from Vienna, Karl Hesse. This organ is still in excellent working condition. The church, however, is most famous for its massive sacristy door that leads to what was used as a treasury room previously. 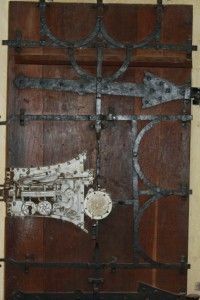 This 16th century door was constructed entirely using oak tree and it boasts of an impressive locking system which requires to be blocked in around 20 points. The door also has an amazing marquetry design. Thus, the church is an amazing building to visit with its red colored roofs and the beautiful surrounding hills. You will find the peaceful outer environment very satisfying and appealing in comparison to the bustling city life. 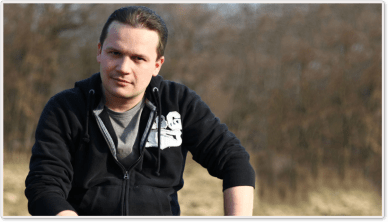 Hungarian cuisine is also very famous worldwide and you will be able to try some of the exquisite dishes from the restaurants located nearby the church. Accommodation options are also available right across the church. It is truly one of the most breathtaking sites in Romania and an excellent place to revisit the forgotten villages of Transylvania. Visit Biertan Medieval Fortified Church most luxuriously with Your Guide in Transylvania.